Jill Of All Trades: #SetLookAllDay with #FALPowderCream! Being a full-time working mother plus blogger is as good as juggling three jobs. Which in plain words means I have to be up and about in the morning and am on my feet all day, only to snooze post midnight once the li'l one is asleep. And weekends go in running errands, going for blogger meets or taking the kiddo to the garden. Amidst all this, I also try to fit in some me-time like going for Zumba or reading a book or watching a movie (on the Macbook or smartphone, in bits and parts). Being a blogger or influencer, or going for work-meetings means one has to look good (and fresh). I simply cannot make it look like I've not slept properly due to the kiddo waking up in the middle of the night or because I am exhausted at the end of the week. 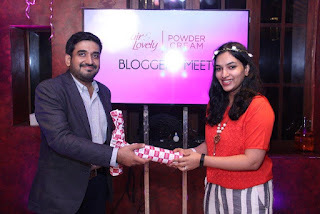 So I obviously need some magical help with this and few days ago, I got that when I was invited for the official launch of the Fair and Lovely Powder Cream. 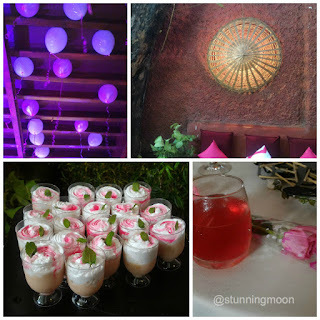 From balloons to flowers to cute looking dessert - the day had it all! Now when you think of Fair and Lovely, the first thing that comes to your mind is their Fairness Cream. But do not confuse this product with that, this is an all new combination of cream and powder - a cream, that feels as light and non-oily as powder and keeps you looking fresh from morning till night - as it claims to be lasting for 14 hours. The left pic was taken in the morning and the right in the evening, I was a bit tired, but not my skin! Each one of us bloggers were asked to try the product - it blended well in my skin and didn't feel oily. 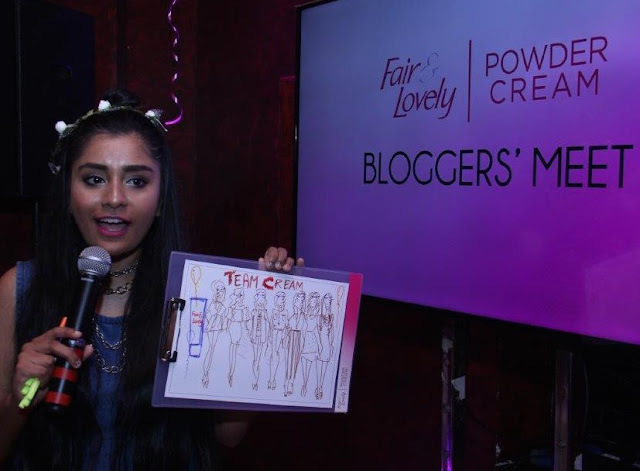 Mumbai is a really humid place, being a tropical city, so all of us with oily or combination skin definitely don't survive without touch-ups with some compact powder, so I was eager to see the results of the Fair and Lovely Powder Cream at end of the day. Team Cream member Michelle with her amazing poster of the team - Can you spot me? To keep us engaged throughout the day - there are many games and activities which were super fun. 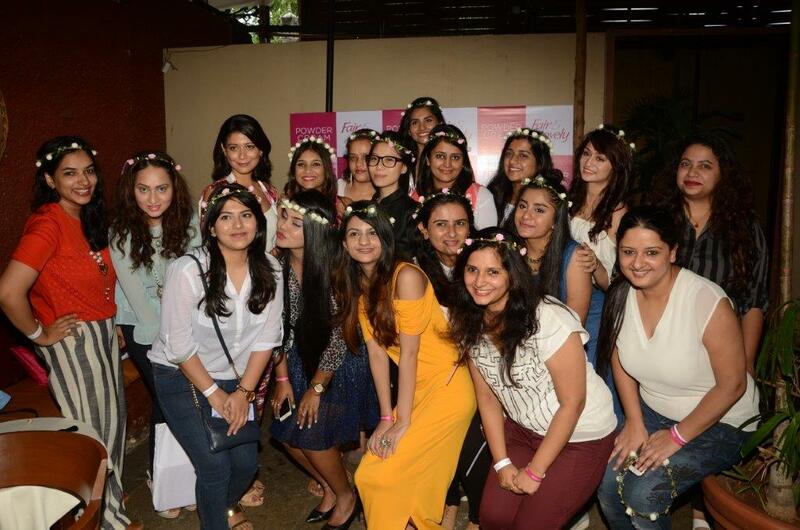 There was 'Pass the current', Sketch the Team Poster, Beauty Taboo, Quiz round and unlock the treasure, and TVC making contest. I was chosen the team captain for Team Cream and at the end of the day our team won with highest points. Not only that, I personally won quite a few games and got back so many goodies home! Yay! After all the running around, going inside air-conditioning and coming outside in the humid heat frequently and hours later when I clicked a selfie, my face still looked fresh and 'selfie-ready'! This product is mainly made keeping in mind all the college going girls or just graduated and first job ladies who are running around from early morning till late night - making their name or being a breadwinner in the family or gearing up for a brighter future! With Bhumika, Megha and Michelle - Propping it up! Group pic with the lovely host for the day Frieshia. 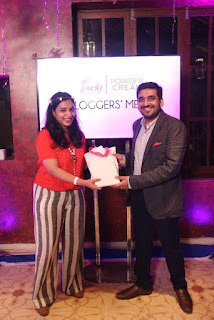 It was lovely meeting the entire team of Fair and Lovely, as well as my blogger friends and meeting some new lovely blogger ladies! Thank you for the fun and frolic day F&L! I also have some great news for all you readers - If you want to try the Fair and Lovely Powder Cream and would like to win goodies, stay tuned to my Twitter handle as something interesting will be coming soon! 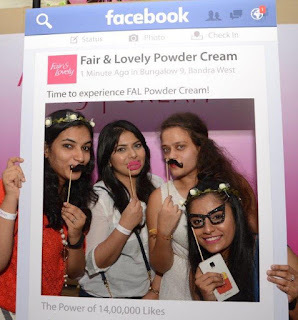 Fair & Lovely, the pioneer of skin lightening creams and face care expert, extends its portfolio by introducing the new Fair & Lovely Powder Cream. Created with a breakthrough fairness formulation, the revolutionary product is the perfect blend of brightening powder with fairness cream. 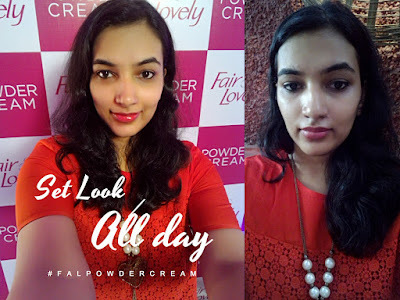 Fair & Lovely Powder Cream offers an instant and lasting fairness for up to 14 hours while keeping the skin nourished, giving you a flawless look throughout the day. The answer to every woman’s beauty needs, Fair & Lovely Powder cream cuts down the time consuming ritual of touch ups by giving you a set look for the whole day. The product was developed keeping in mind the need of millions of young Indian women who spend the major part of their day outside the house, attending college or travelling which leaves little scope of checking their look time and again. There is nothing worse than having a roller coaster day and in between checking your look to see that the glow has completely vanished. You try to overcome dullness by reapplying fairness cream every 3-4 hours or applying powder on top of the cream to mitigate the oil build-up. Fair& Lovely Powder Cream gives your skin a shine-free soft smooth look that keeps your fairand radiant look set throughout the day. Skip the hassle of constantly checking your look with the new Fair & Lovely Powder Cream that ensures instant & long lasting fairness for not 1 or 2 but 14 hours. The unique brightening powder absorbs oil and the advanced multivitamin creams gives you expert treatment like fairness, helping you maintain a long lasting fairness look. Fair & Lovely Powder Cream blends naturally with Indian skin tones adding a soft & smooth glow to the skin, leading to flawless fairness all day long. 4. After finishing these, just comment on this blog post saying DONE. Three lucky girls will win the FAL Powder Cream! *Contest closes on midnight 15th August 2016. Congratulations Kavita! Please send in your postal address and contact number on Twitter! Powder Cream? Something new! I need to try it!